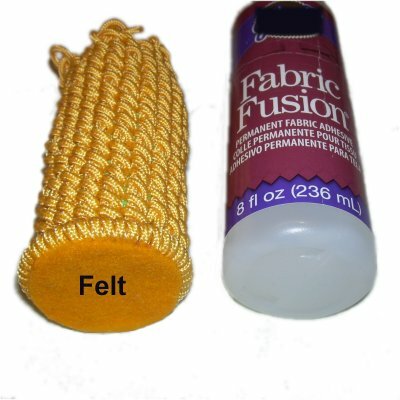 Description: This Paracord Container is made with nylon Parachute cord. It can be any size, simply by increasing the number of cords. 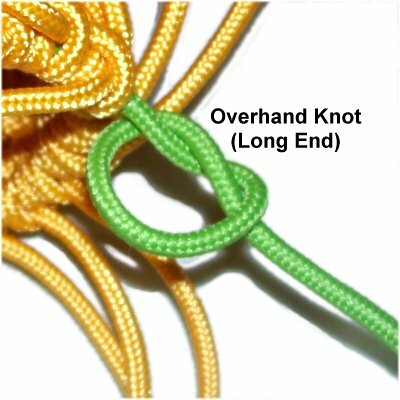 The primary decorative knot featured is the Clove Hitch, which is similar to the back of a DHH. Along the top edge is a simple Picot Design made with Square Knots. This can be changed if you prefer a different mounting technique. This Macrame pattern is rated Easy, suitable for a beginner's project. Start by deciding what size Paracord Container you wish to make. The height is the size from top to bottom. The circumference is the size all the way around the container (same size as the ring). Use the table below to determine the length and number of working cords, along with the total amount for the project. Divide by 36 to determine the yards. 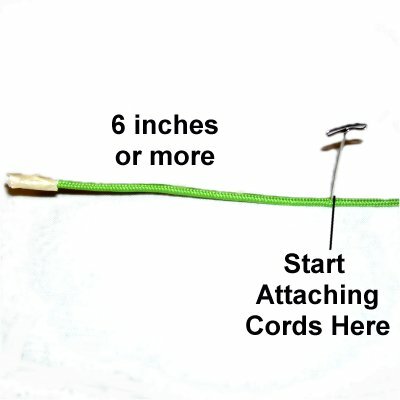 Cut one holding cord (green in images), 1 yard longer than the working cords. 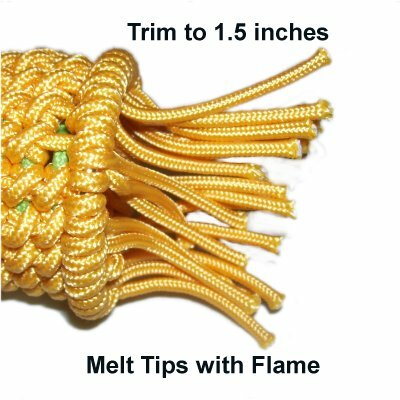 Parachute cord must be prepared by melting the tips with a flame (BBQ lighter) prior to knotting. There is an inner core than can slip out if you don't do this. You should also wrap small pieces of masking tape around the tips, just in case. Step 1: Fold two cords in half and secure them to your board at the fold. Mentally number the four segments. Step 2: Cross cord 2 over cord 3. Push the crossed area up closer to the pins (see next image). 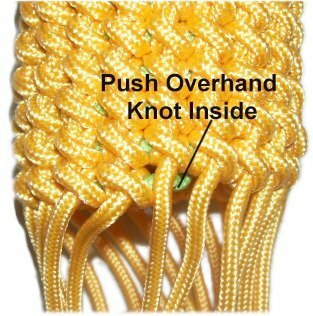 Step 3: To form the picots at the top of the Paracord Container, follow the four steps below to make a Square Knot. 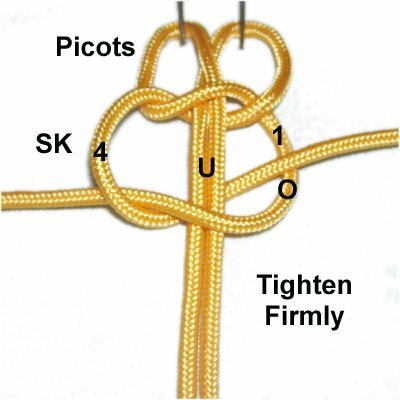 The picots are formed by placing the SK slightly below the folded area of the cords. Don't like the picots? Use a different mounting technique, beginning in step 4. 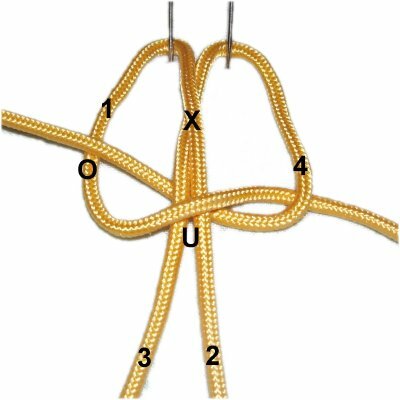 Important: Make sure you tie the Square knot below the crossed area of cords 2 and 3, which is indicated by the X in these images. << Move cord 1 to the right, over cords 3 and 2, and under cord 4. Tighten this portion of the SK so it rests 1/2-inch below the fold. Tighten both halves firmly, keeping the picots 1/2 inch in size. Step 4: Arrange the holding cord on your board horizontally. Measure at least 6 inches from one end, and place a pin at that point. That segment is called the "tail". You will start attaching the working cords at the pin, moving right. 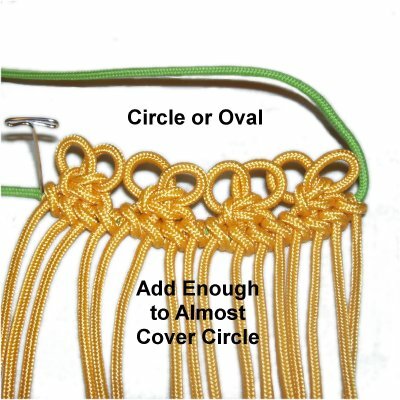 The Clove Hitch is used to mount the SK Picot designs onto the holding cord. It's made in two steps, which are shown below. Should you decide to use a different mounting technique, go to step 7. Step 5: Start by securing one SK picot design just above the holding cord. 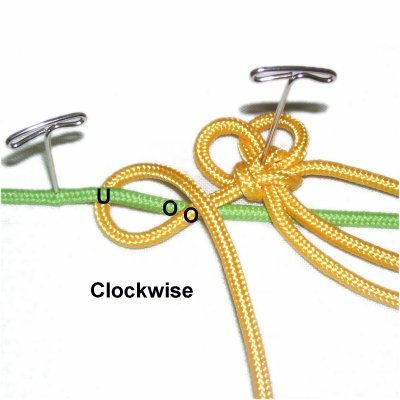 Use the segment furthest to the left to make a clockwise loop, passing over - under the holding cord. It should pass over the working cord as you bring it to the right for the next step. 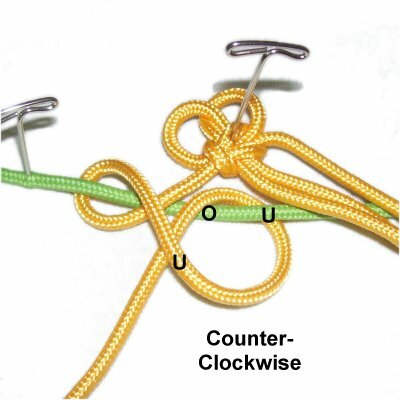 Make the next loop to the right of the first, rotating in a counter-clockwise direction. Pass under - over the holding cord. As you pull the end down, pass under the working cord. 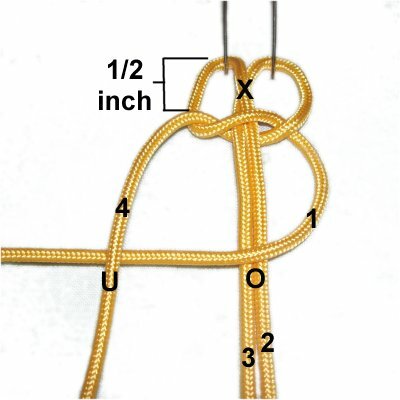 Tighten both loops as much as possible, to eliminate any gaps between the SK and the Clove Hitch. Step 6: Slide the first Clove Hitch next to the pin. 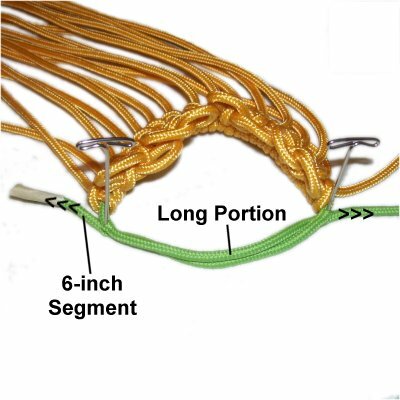 Tie a Clove Hitch with the remaining 4 segments of the SK design. 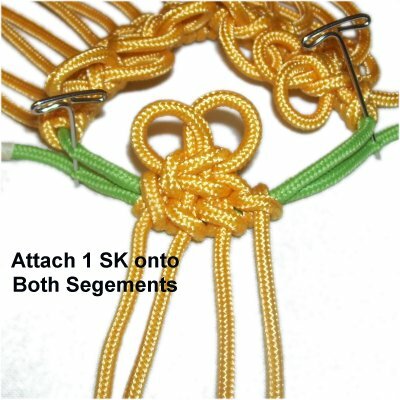 When you are finished, arrange the SK picot design upright. Step 7: Repeat step 5 with most of the remaining working cords. Form a circle or oval, and add more to the holding cord. Save one SK design (or one cord) for the next step. 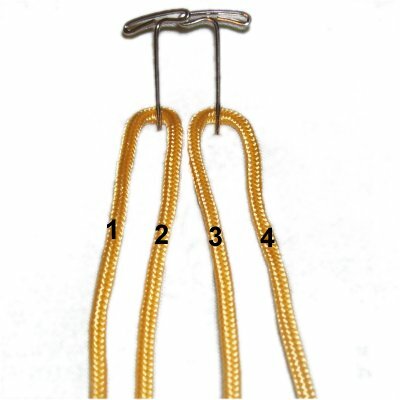 Step 7, continued: Arrange the mounted cords so the first and last knots are touching. Then measure to determine if it is close to the size you are aiming for. Add or subtract cords to get it to the right size. Step 8: Arrange the holding cord so the long portion and the 6-inch tail are close to each other, heading in opposite directions. 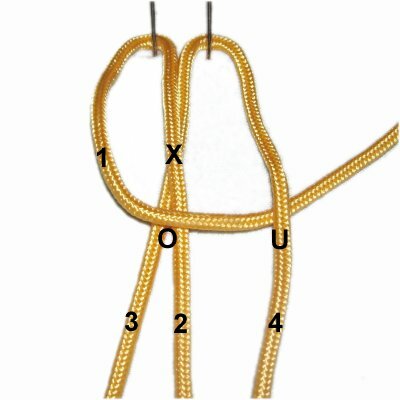 Step 9: Attach the last SK design (or last cord) onto BOTH segments of the holding cord, with the same technique used for the others. 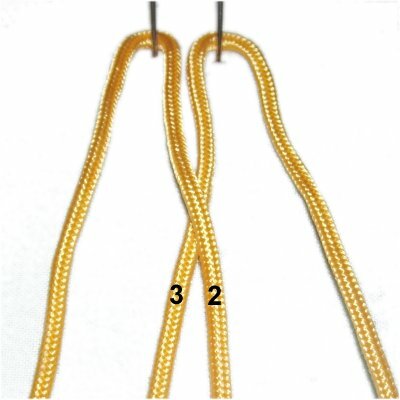 Step 10: Pull both portions of the holding cord to close the circle. 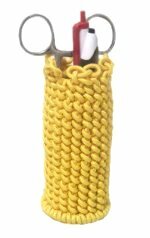 Measure to make sure the top of the Paracord Container is the size you want, and make adjustments if needed. Step 11: You will now create rows of Clove Hitches to make the rest of the Paracord Container. Step 11, continued: A great way to secure the Paracord Container is to push a pin through the short tail, and then into your board (see next image). You can then move the container around as needed while tying the knots. In the image above, the holding cord was moved down a bit, so you could see the details. 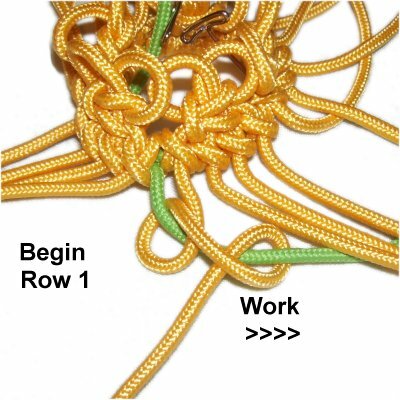 It should be kept horizontal, close to the previous row of knots. Make sure the holding cord is always under the working cords. 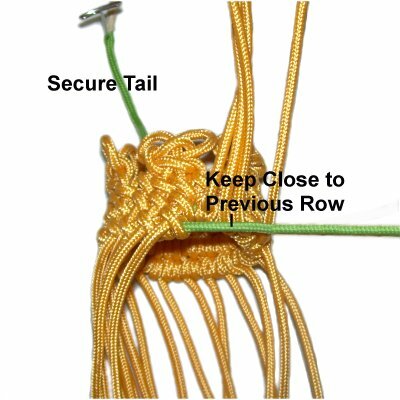 Tighten each Clove Hitch as much as you can, to eliminate gaps between the knots. Step 11, continued: Tie several rows of Clove Hitches, measuring as you progress. Stop when the Paracord Container is the height you want. Keep in mind that you will be attaching a ring at the bottom, which will add to the height. 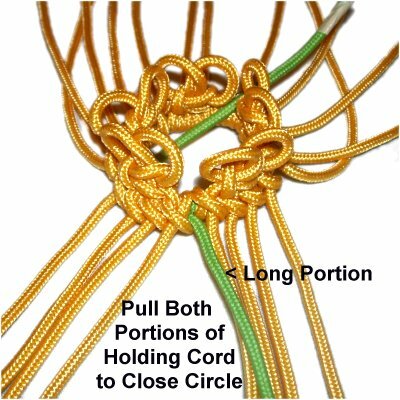 Step 12: Finish off the long portion of the holding cord by tying an Overhand knot. It should rest close to the last Clove Hitch tied. Cut off the excess material (holding cord) beyond the knot. Apply a flame to the tip of the cord so the material melts. Push the Overhand knot inside the container, prior to adding the ring. Notice how the last two rows of the Paracord Container are uneven? Don't panic, this is why you attach the ring to the bottom - to make it more level. Step 13: Pass all the working cords through the ring. 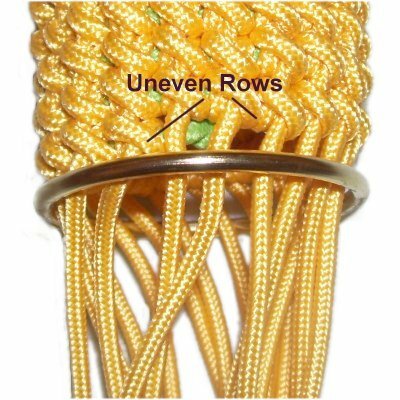 Locate the most uneven area, which is between the last row of knots (bottom) and the row above it. You will start with the last working cord you attached to the holding cord, which is in the bottom row. Move the cord you selected over - under the ring. The end should rest to the left (counter-clockwise). Pass over - under the ring, and over the cord as you pull it down. Tighten both halves firmly, so the ring touches the Clove Hitches in the bottom row. 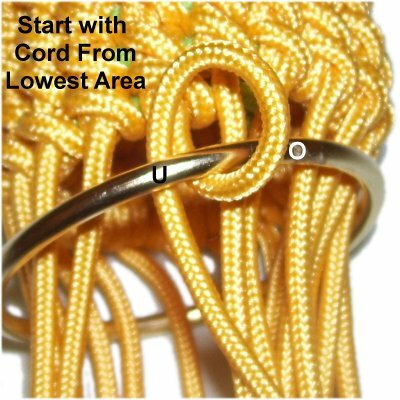 Step 14: The second cord you attach is not from the bottom row, but is from the row above it. 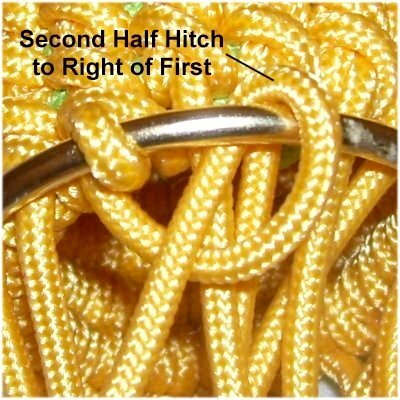 Keep the ring level as you tighten the knot, allowing a small gap between the ring and the Clove Hitch. 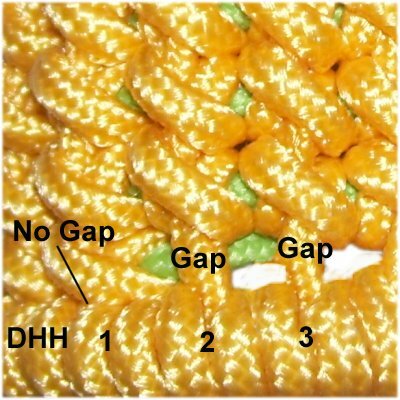 For the first knot, there was no gap. 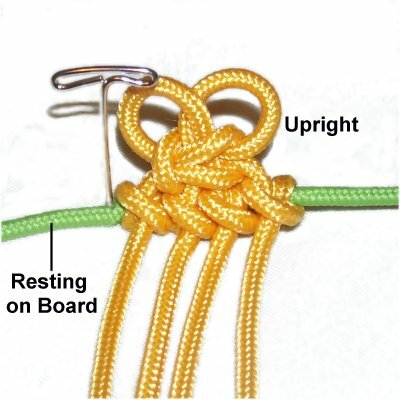 There will be a gap for the third knot, and possibly the 4th. Step 15: After all the cords are attached to the ring, trim them to 1.5 inches. 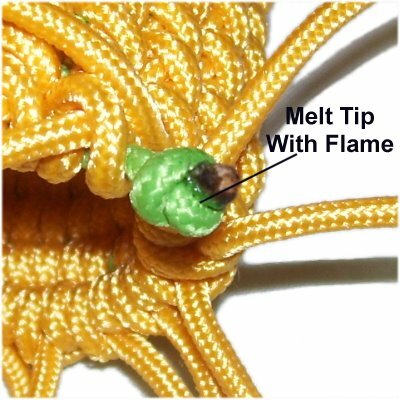 Melt the tips with a flame and push them inside the Paracord Container. Step 16: Apply a piece of felt, cardboard, or other material to close the bottom. Make sure you use FABRIC glue, or something that holds really well. Have any comments about the Paracord Container? Contact Me.